Phlegm, or sputum, is produced when the lungs are inflamed and excess mucous is produced in the respiratory tract. The medical term for blood in the sputum is hemoptysis. According to MedlinePlus, blood in the sputum differs from bleeding that comes from the mouth, stomach or throat because it contains air bubbles combined with mucous. Blood mixed with phlegm could be bright red, rust colored or streaked with red. According to American Family Physician, the usual causes of blood in phlegm are pneumonia, bronchitis and lung cancer in adults. In children, lower respiratory tract infections and aspiration of foreign objects are common reasons for hemoptysis. Bronchitis and pneumonia are infections caused by bacteria or viruses. Blood in the nose associated with respiratory infection and postnasal drip can result in red streaks in the phlegm, as can uncontrolled coughing. Laryngitis can irritate the throat, leading to blood-tinged sputum. Patients with heart disease can develop a condition known as pulmonary edema. The disease causes increased pressure in the lungs, congestion and bloody sputum. MedlinePlus also lists the following as causes of blood in phlegm: tuberculosis, cystic fibrosis, vasculitis (inflammation in the blood vessels of the lungs), and Goodpasture's syndrome, a rare autoimmune disease that affects the lungs and kidneys. A blood clot that forms in the lung or travels from a deep vein leg thrombosis, known as pulmonary embolism, can lead to blood-tinged sputum. Chest X-rays and blood tests are used to detect infection and bleeding disorders to find common causes of hemoptysis. A computed tomographic scan of the chest might be ordered to detect tumors, infiltrates and blood clots. A test known as a bronchoscopy might be performed to look directly at lung tissue. A scope is passed into the lung under sedation to directly visualize the airways. If tumor or autoimmune disorder is suspected, your physician might schedule a biopsy. Blood in phlegm, accompanied by shortness of breath, dizziness, more than a few teaspoons of blood, chest pain, fever or bleeding with urination or defecation requires immediate medical care, according to MedlinePlus. Before using cough suppressants for bronchitis, pneumonia or other respiratory conditions, consult your physician. Clearing the airway of sputum is important. In some cases, taking cough syrup can lead to airway obstruction. 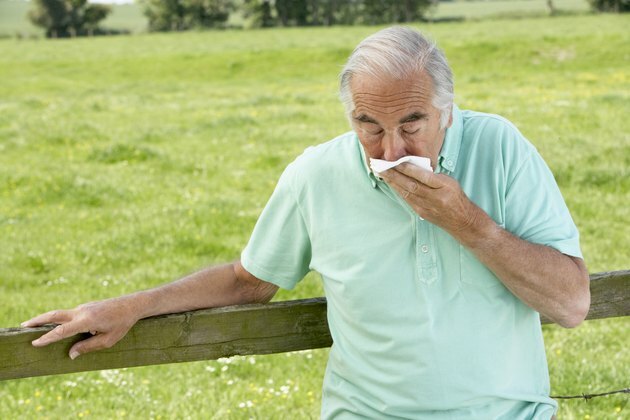 According to MayoClinic.com, coughing up a small amount of blood is common and not usually a cause for alarm.